T he early part of Davíd Godínez Melendez' story is one that is repeated daily, thousands of times, all over Mexico. And it is a quintessentially San Miguel story. Born to a working-class family in Colonia Guadalupe, Davíd got his first job at age 10, working five hours every day after school in a papel-mache factory. "I painted on the clouds," he explains. "I thought the colors were pretty. They showed me what to do, but I didn't learn it very well." By 13, he'd moved to another taller, or workshop, this one making brass and glass boxes. "Working in the artesania workshops was about the only job there was in San Miguel de Allende." "Show me how you do that," became his mantra. He was a curious kid, but he was also practical. "If you knew how to do more things, they paid you better." Soon he moved on to tin work, learning stamping, cutting forms, punching. His life was a half day at school and a half day at work. Like so many San Miguel de Allende kids, he had relatives who worked in the U.S. and Davíd Godínez was intensely curious about it. "When my brother-in-law came home, I was always asking 'What's up there?'" When Davíd graduated from junior high, he said, "I gotta go." His mother was against it, but Davíd wanted the adventure and the work. "I'd never been farther than Celaya or Dolores," he says with a smile, citing two towns less than an hour from San Miguel de Allende. So north he went, along with a friend. "It was hot, waiting to cross the river at Nuevo Laredo. There were bugs as we waited for the night. While we were hiding, this guy came along with a gun and we had to pay him off. All along the river, there were dozens, maybe hundreds, of people hiding in the bushes, waiting to cross." Finally, it was time for the dash. "It was like a solid chain of people crossing the river. When the Border Patrol came along, I dove in the bushes and lost my friend." Davíd didn't make it that time, but a month later he was back, this time riding under a train carriage—one guy to each car—holding on to the greasy metal. The ride was long, the motion of the train hypnotic, and he fell asleep. He was supposed to get off at a place where the train slowed down in the desert, but when he woke up, the train was stopped in Phoenix. Davíd Godínez was alone, with no water, no English, in a strange place. He was 16. But then he got lucky and soon had his first job in the States, digging a ditch for two bucks a day and meals. The family of Chicanos he worked for more or less adopted him. "My Grandma always told me, 'Wherever you go, make yourself useful.' I always found something to do so they let me stay." "Everything I saw up there was so new and clean—the big buildings, the nice park. I went to a hamburger stand, and I didn't even know how to order. I got some food, but it wasn't what I wanted." To get a better job, he needed a Social Security card so he borrowed one from a friend. "I became Arnold," he says with a grin, "and got a job in a Mexican restaurant." After two years, Davíd was picked up by the Border Patrol and sent back home to Mexico. He went back to school, met Claudia, the girl he would later marry, and began working for an American artist/sculptor/jeweler named Joe Miller, a San Miguel part-timer. Davíd Godínez had his next experience in El Norte two years later when he decided to "go see Joe" in Alabama. It was easier to cross the border this time. He knew what he was doing. Once across, it was a long walk. "We slept all day and walked all night. We knew to look for the windmills. That meant there was water there. One night it was really dark, there wasn't any moon. We found some nice grass and fell asleep. We woke up in a cemetery." They walked as far as Kerrville, Texas, sleeping beside onion feels with the smell of onions all around them. They stopped at houses and begged for food. "The kindness of strangers was really wonderful to me." They did finally reach Alabama, surprising Joe Miller by knocking on his door. "I loved it in Alabama. We lived in Joe's studio, surrounded by art, sculpture, painting, jewelry. It was a real picture of another life." Working for Joe, Davíd began to learn. "I learned by doing." He also went to school to learn English. After two years, he'd had enough. Joe was about to make a trip to San Miguel de Allende. "Joe?" Davíd asked. "Can I ride with you? I need to go home." then the next part of Davíd Godínez' story began, and this is where his story becomes unique. His life as a silversmith started out pretty mundane. He heard a guy was looking for a buffer for silver jewelry. "I figured it was the same as buffing aluminum, but it wasn't. I had to learn it all over again." 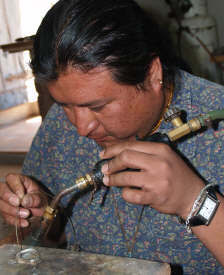 He worked in a few different jewelry talleres, always watching, always learning. He had a chance to buy out a studio from a guy returning to the States. "But I didn't know how to use it. I had all these tools and couldn't do anything with them." But he kept trying, kept learning by doing, making mistakes, fixing them, trying again. And that is how Davíd Godínez became one of the most interesting and innovative silversmiths and jewelers in San Miguel de Allende. Today, he is a master of his craft. Watching him work, you can see his confidence in the sureness of his hand, the familiarity with which he handles his tools. "You have to be very relaxed to make jewelry, very comfortable with yourself," he claims. "And you can't be in a hurry." He says he's never sure how a piece will turn out when he starts. He doesn't draw his pieces in advance. His work is all freestyle. "Sometimes I don't have any idea. I put some nice music on and let it guide me." His designs come from his head and his heart. "Most of the time, the stone tells you what it wants to be," he explains. "Then you just have to provide it." The results are fresh, different. People familiar with his work can often look at a case full of jewelry, point to one piece and say "That's a Davíd Godínez design." No two pieces are ever exactly alike, though sometimes he'll see a copy of a piece he's made. "If people steal my designs, well, I'm glad to be an inspiration for them. It took me a while to get to that point. I used to get mad. Now, I just make something different." Now in his 40s, Davíd Godínez has found his voice and his art. He lives with his wife Claudia and their daughter, Andrea, 8. He makes his jewelry, shares his skills with others. He now teaches in one-on-one sessions. Most of his students are Americans. "First you learn the basics, how to make a clean bezel to hold the stone. You learn to work with sheet, wire, how to solder. But really it's all basic. What's a bracelet? It's a band. What's a ring? It's a band. Then you hammer it, burn it, melt it, stamp it. It's just metal. But the metal becomes alive by what you do to it." From papel mache painter to tinsmith to ditch digger to waiter to silversmith to consummate San Miguel artist, Davíd Godínez has lived an adventure and arrived back home. Now he loves the freedom to simply do what he loves. Getting paid for it is the icing. "Money is important," he says, "but it's not basic. Basic is to enjoy what you're doing." And the future? "I don't have a plan. I want to make jewelry, have a nice studio, a nice home, send my daughter to college. Living in peace, sharing with people, that's what's important." 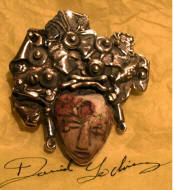 Davíd Godínez' work can be seen at the Sua Store, Mesones 77, and at La Tienda at the Biblioteca Pública. On Sundays, he shows his work in the patio of the Biblioteca before the House & Garden Tour. He also usually shows at the Arts & Crafts Fair held various weekends throughout the year at the Instituto Allende.